But I know that if everyone had a personal experience with a living, breathing chicken, they would stop seeing them as unfeeling "birdbrains". If I can urge people to do just one thing, it's to visit a farm sanctuary (not a petting zoo or other facility where animals are simply on display while they're cute, then discarded as they age or become ill) and interact with a chicken or turkey. My sense is that you'll ugly cry yourself into feeling compassion for these magnificent beings. The first time I held a chicken I cried - I mean, ugly cried. 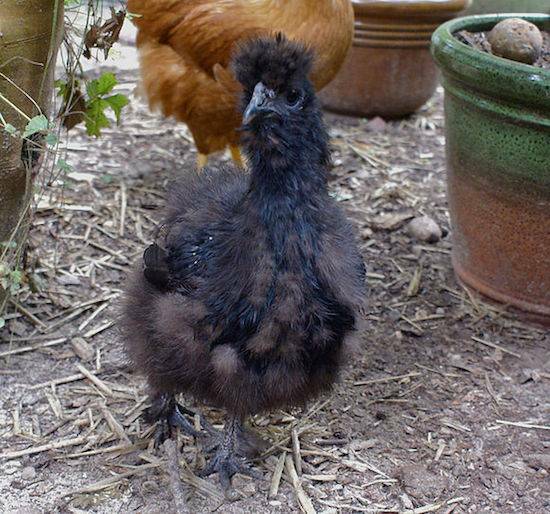 The chicken was a Silkie, black and beautiful, being raised by a neighbour who was getting into the backyard chicken movement. I was struck by how tiny her body was, how fragile she seemed. My fingers explored her frame and felt the familiar 'drumstick', the breast bone, the bony wings. I had held many chicken parts in my hands as I readied to eat them, but to see those connected to a real, living, breathing and warm being shocked me to my core. She looked up at me with nothing but trust and love. Then came the tears. My neighbour was confused and embarrassed for me, looked away and busied himself with something. I put the chicken down gently. Rather than running away from me, she stood there, looking up at me, seemingly wanting to be picked up again. It was a strange, almost mystical experience. I went about my life - still a vegetarian (I had been since I was 13) but not experiencing another chicken until I started doing farmed animal cruelty investigations. It was inevitable that I'd cross paths with chickens again. Then it happened. 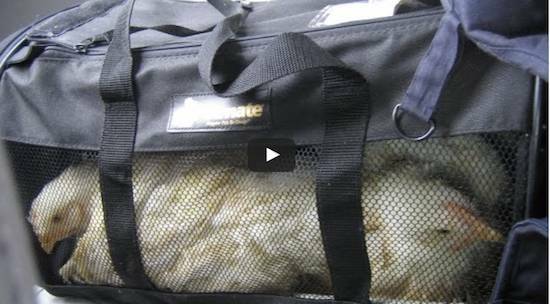 My colleague and I were documenting trailers crammed with birds at a Quebec chicken slaughterhouse (7,000-11,000 chickens are stuffed onto each trailer). While we were inspecting and filming the trailers, we saw that one of the drivers had failed to install the dividers between the columns of stacked crates. When he had slammed on the brakes, the columns fell forward, forcibly ejecting birds and leaving some lodged or crushed between the crates. We worked to right the crates to reach the birds. We were too late for many, but one was still alive. We named her Ginette. We then heard a tiny peep and our eyes dropped to the ground (all chickens are still babies when sent to slaughter - blue-eyed and peeping). There we saw a tiny bird huddled beneath the trailer's tires. The bird must have clung to the side of a crate after the crash, then fallen to the ground after it parked. The driver would soon return to take his trailer to the unloading area, crushing the bird beneath the tire. We scooped him up and hid both he and Ginette under our jackets as we ran back to the safety of the car. Ginette and Denis (the boy under the tire) were different than the Silkie - they were traumatized and scared - but their fates were to be the same. Thankfully, we were able to change the destiny of these two and drove them to a sanctuary where they were able to live out their lives in peace. As my investigative career continued, I was fortunate to meet many chickens and turkeys. Each meeting brought more awareness and insight into what incredible beings birds are. They are loving, forgiving, and communicate constantly. They also suffer both physical and emotional pain and mourn just as all animals do. To me, investigations involving birds are the most difficult. 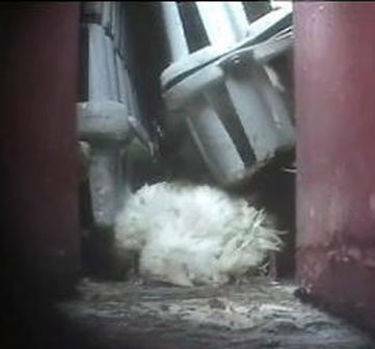 Callously thrown and dunked like basketballs, kicked like soccer balls, slammed into crates and swung around by their heads, wings or legs - all the while terrified and suffering.